Wundervolles Grundstück mit sehr schönem Pool. Great to hear you had a good time. Wir hatten eine wundervolle Zeit in Al Mulin del Isola. Das Haus verfügt über alle benötigte Ausstattung in einem tadellosen Zustand. Das ganze Haus, wie auch das Grundstück und der Pool sind sehr gepflegt und die Lage direkt am Fluss ist wirklich zauberhaft. Der Vermieter Fabio war unglaublich zuvorkommen, hilfsbereit und freundlich und hat somit auch dazu beigetragen das wir einen herrlichen Urlaub in der Toskana verbracht haben. We are glad you enjoyed your stay at the Mill and that you had a magical time! Ruhige Lage, beindruckendes Panorama, TOP!!! Das Haus bietet wirklich alles, was es verspricht! Wir waren zu dritt da und es war groß genug, dass jeder auch mal für sich sein konnte. Das Grundstück ist super gepflegt und sehr ruhig gelegen, wer seine Privatsphäre haben möchte, ist genau richtig. Die Wiese hinter dem Pool ist perfekt für Badmington-Schlachten geeignet. Das Allerbeste: durch die Lage wird es auch im August nachts kühl (nicht unangenehm), dass man ohne Klimanlage schlafen kann und es so gut wie keine Mücken gibt. Fabio ist ein äußerst netter und hilfbereiter Vermieter. Ein Willkommenspaket mit regionalen Produkten hat unseren supertollen Aufenthalt abgerundet. Sehr empfehlenswert. Thank you for your detailed review of this great place! We are happy to hear that you appreciated this beautiful location and the care taken in presenting this lovely old mill. We stayed at the house for 11 days and loved everything about it. The house was clean and was equipped with everything one possibly could need. The garden was fantastic, and the pool was just the right size and depth (130 cm) for both us and the kids (8 and 6 years old) to enjoy. 20 meters from the house was the riverbed where we also could take a swim, although the water was much colder. Fabio and his wife Elise were lovely, friendly and very helpful. The last evening they invited us to their own home for home made Italian pizza, which was delicious and so appreciated. We would love to return some day, and we can really recommend this house to others.Thanks again Fabio and Elise! Thank you for your review. Glad to hear you enjoyed this property which is lovingly cared for by the owners. Great that you swam in the river too, which is a favourite past time there! Fabio and Elisa would love to have you as guests again. We had the most wonderful time, the property was lovely, and beautifully clean with everything we could have needed, we were very grateful for the welcome gifts that were left for us. 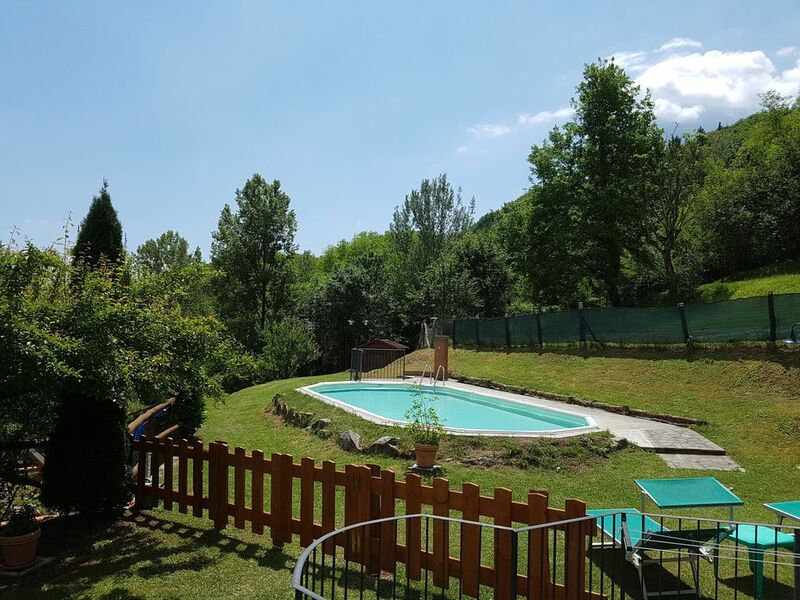 The setting was wonderful and while we enjoyed exploring Tuscany and the magnificent scenery, we also had some lovely peaceful time at the property and made good use of the pool. The only problem was that one week wasn't long enough. We hope to visit again soon. Fantastic to hear you loved this beautiful place and we do hope to hear from you another time. Thanks for this, and we do hope that you come again!